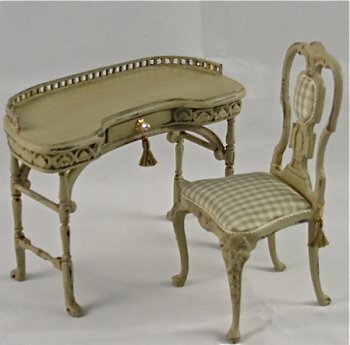 This sweet writing desk could be used in your light and airy summer dollhouse, or as an eclectic piece among your luxurious Downton Abby furnishings ;D It is finished in my Old Versailles and is upholstered in the most delicate cream and green silk check fabric. Ooh, I can't wait for next season! 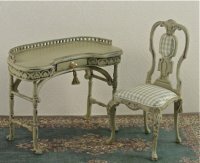 This one is sold, if you want this desk, please allow 2 weeks for me to finish it.